…Stop…if you want to get any closer…buy me a drink. Or something. My secret involves a universal camera adapter and filters. I discovered a way to use them simultaneously, but don’t worry! It’s a very simple technique, which is limited only by your unrelenting imagination. That’s it! 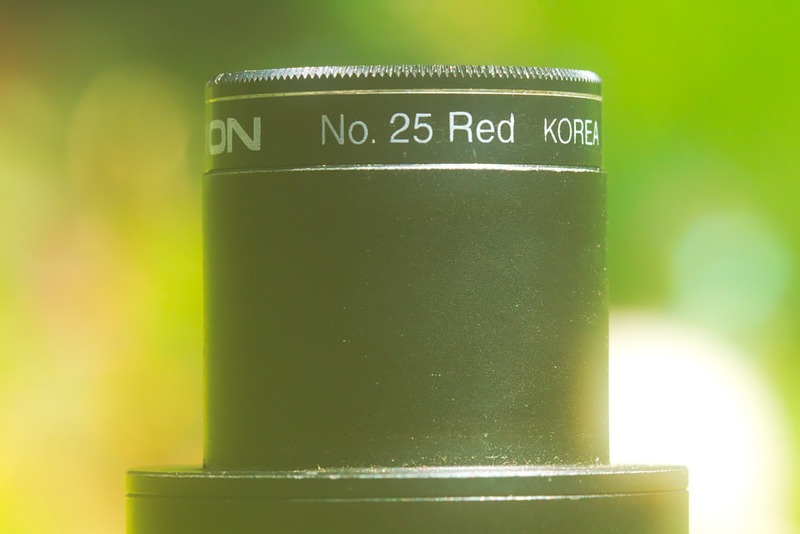 If you happen to own the Orion universal camera adapter, then chances are, you probably own some filters. A moon filter (any transmission) will work and so do planetary filters. As long as the specific filter is made to fit onto a 1.25″ barrel, then it should work. Experiment with any filter you own and see what happens. Orion’s Universal Camera Adapter is a simple, but intricate tool. 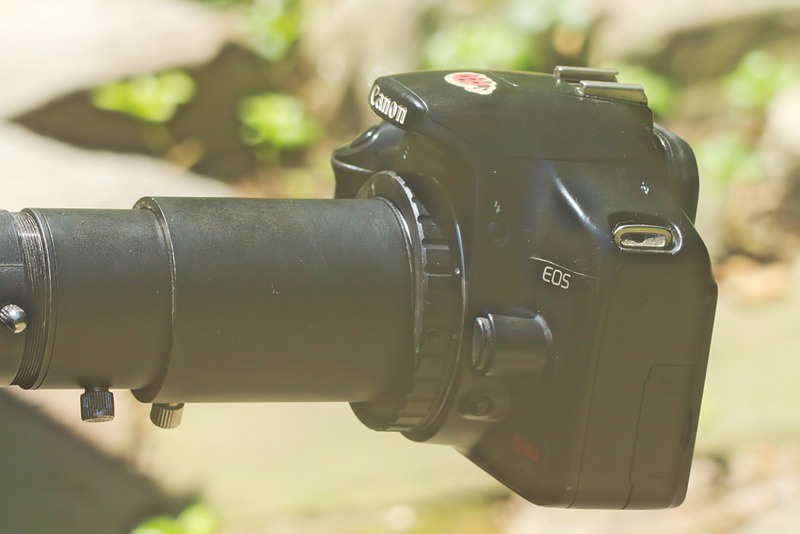 The adapter is capable of prime focus photography AND eyepiece projection. 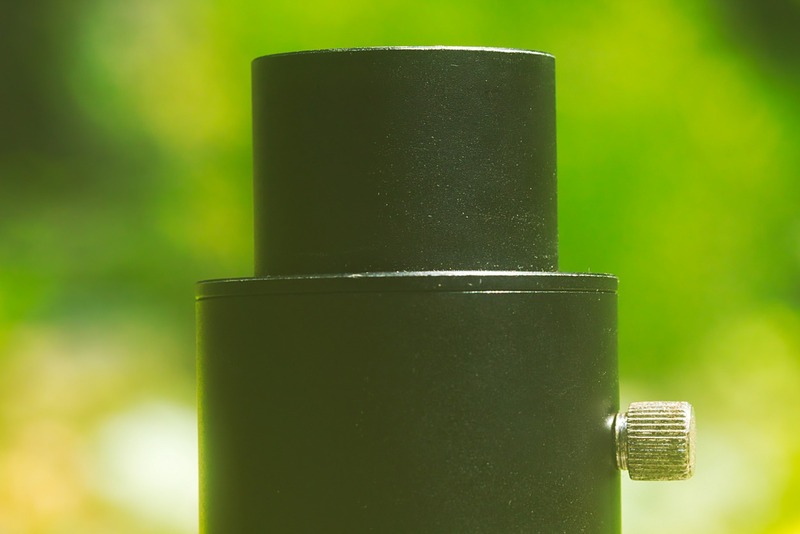 The adapter barrel can house an eyepiece, which sits between the camera and telescope. 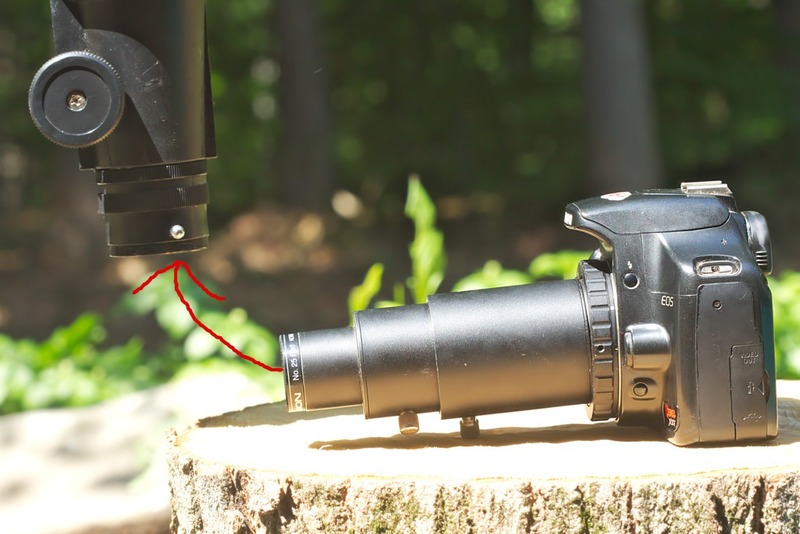 The barrel can also be manually adjusted, so the magnification can be slightly tweaked. The adapter is surely useful, but you know what? The secret I’m about to share will make it even more versatile. It’s not very apparent, but it’s possible to attach a filter. The top of the nose-end has threads embedded inside the barrel. I’m not exactly sure what the threads are supposed to be used for, so don’t ask. Please. Step One—Attach Filter To Universal Camera Adapter. Do you see that massive red arrow? It illustrates where the filter needs to be attached. Screw the filter onto the adapter’s nose-end and…that’s it! Done. Simple. Easy. I told you so. The universal camera adapter slides into the telescope’s 1.25″ focus barrel (like a star diagonal) and needs to be secured! Make sure the screws are tight, or the adapter might slide out, causing your camera to explode into a shower of expensive shower. Don’t let that happen. Orion’s universal camera adapter is technically designed to be used with refractors and reflectors, however, I have attached the adapter onto my 102mm Maksutov. 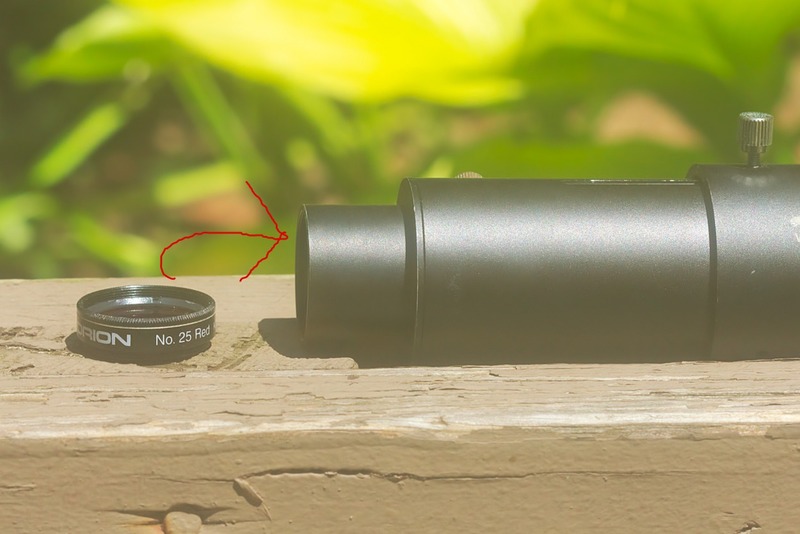 As long as the telescope’s focus barrel is 1.25″, then there is no reason why the adapter shouldn’t fit. **Reminder** Don’t forget! Tighten The Damn Screws! Tight screws! That’s what I’m talkin’ about! How practical is this secret? I don’t know…what is that saying? Knowledge is power? Something like that. I’m sure you’ll have a use for this secret…someday. Planetary filters are useful for bringing out subtle details. Various features become more apparent depending on the specific filter’s qualities. The green filter I used slightly increased the contrast between the lunar highlands and maria. Yellow filters are interesting—they help make lunar impact ray systems more visually discernible (especially around Copernicus Crater). Crater contrast increases and bright areas become more apparent. The image above was taken with a 13% transmission filter, which dims the lunar surface. 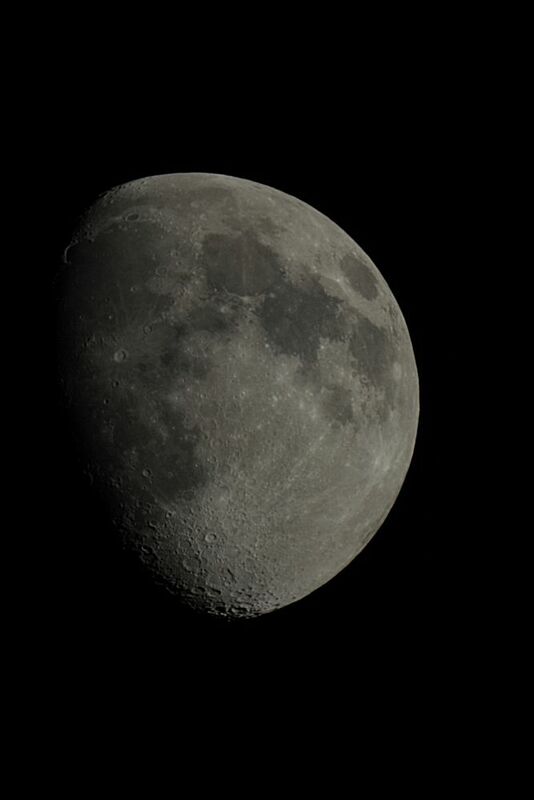 Personally, I don’t notice much of a difference—it looks like a normal moon photograph (without any filter). 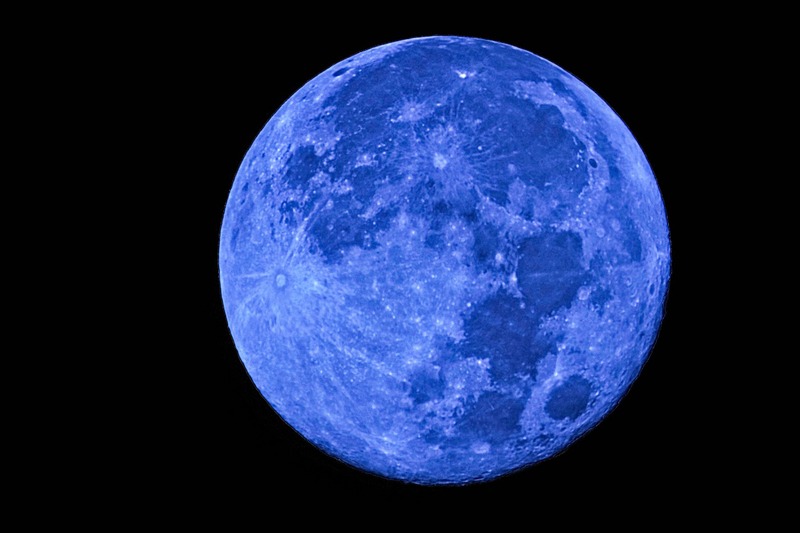 Now that’s a blue moon! In celebration of the July 31 blue moon—I whipped up this image—which was taken with a blue planetary filter. Blue filters create a nice overall lunar contrast, but I enhanced this photographed quite a bit. 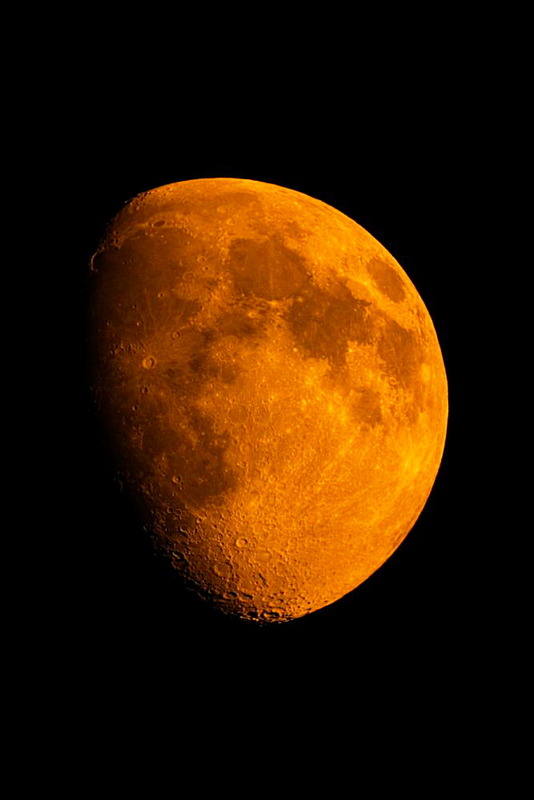 The contrast is much heavier than normal, which created a great distinction between the lunar low and highlands. There you go! One more secret at your disposal. You can thank me later. Thank you for following my blog! Come back soon as I will yours! You have a unique angle! Yea..you learn something new and useful! every day…I learned so much that half the time I do not know what to experiment with first! I know what you mean! This particular secret is a bit obscure, but I have a feeling 1 in every 7000 people might put it to use! Haha. Thanks for posting this awesome hack! 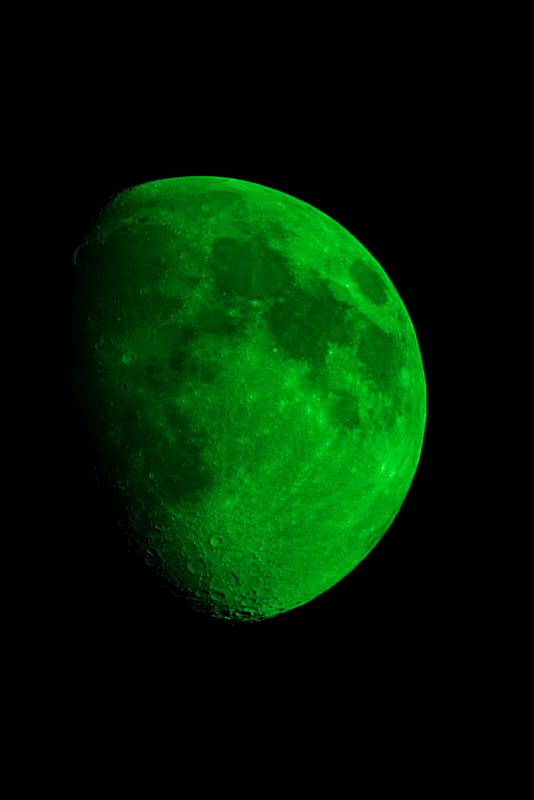 Dig that green moon. No Problem! I don’t use the green filter too often, but it certainly causes a strange aesthetic.